Once again myself and Charlie managed to sneak a game in during the week. 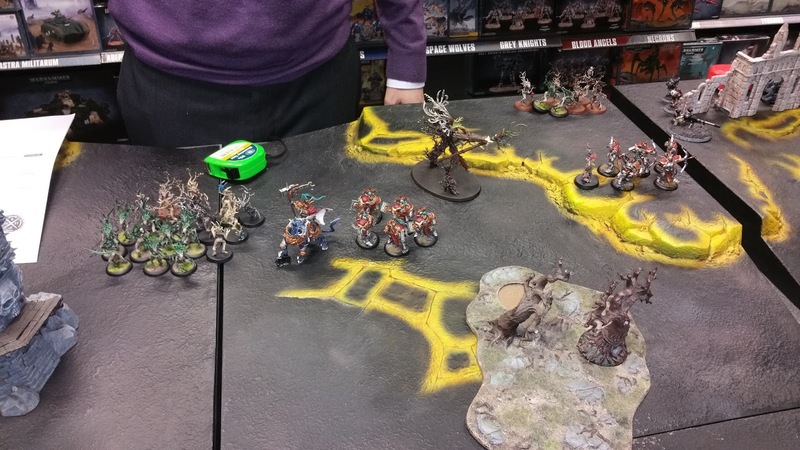 The venue for this small clash is GW leeds which appears now to have no other AoS gamers. A pity. Deep in the woods of Ghyran the Lord Celestant and his Sylvaneth allies have stumbled across a blasted glade. A powerful icon of chaos spreads death and destruction before it and as it's worshippers gather strange discordant blasts roll across the glade felling yet more trees. Although short on numbers the Lord Celestant is guaranteed further reinforcements by the Ancient Treelord so they prepare to clear this area of the invaders. 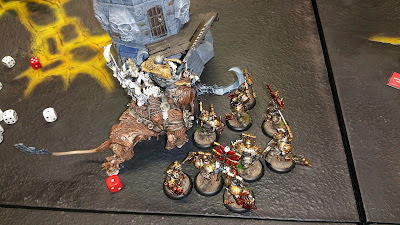 On seeing the approaching foe the Mighty Khorne Lord gathers his motley forces together around the artifact. They know they must crush these attackers and prevent them from destroying the icon. After our last game we opted for a simpler scenario this time to allow us to get well into the game in the time we had. The scenario was Spllbreakers from the Quest for Ghal Maraz book, as I'd been the attacker in all 3 in our previous games I chose to be defender for this one forcing those treeman to leave the safety of their wildwoods and come to me. We used clash comp to balance the forces going for a 12 point cap for our starting force but using no other comp rules other than base to base measurement. 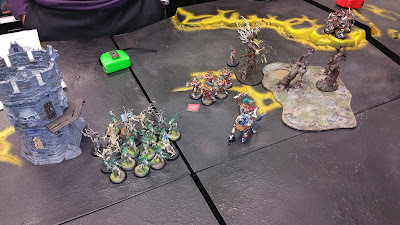 As the sylvaneth could essentially replace casualties each turn I also kept a summoning sideboard of 10 bloodletters and 5 Furies in case I took a real mullering. I won the roll for first turn and opted to go second hoping to get a double turn and break the back of the attack. 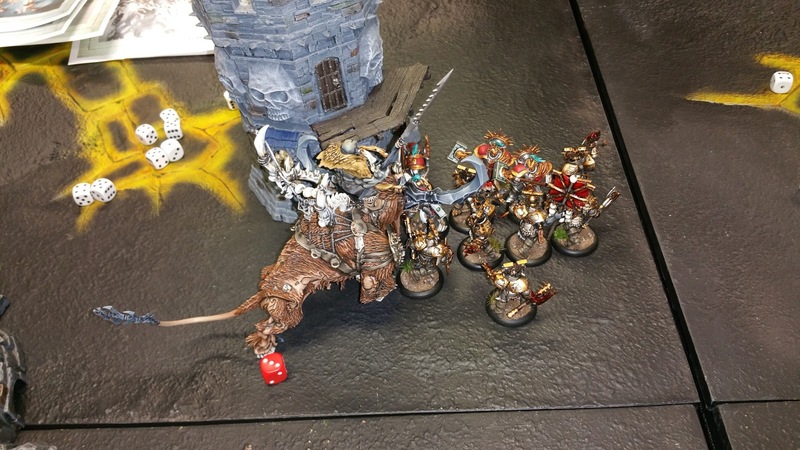 The Lord Celestant held his hammer high and issued commands to his host not to flee the field. The treelord summoned a mighty magical shield to protect the Dryads. So with that the Stormcast and Sylvaneth made a steady advance across the board. 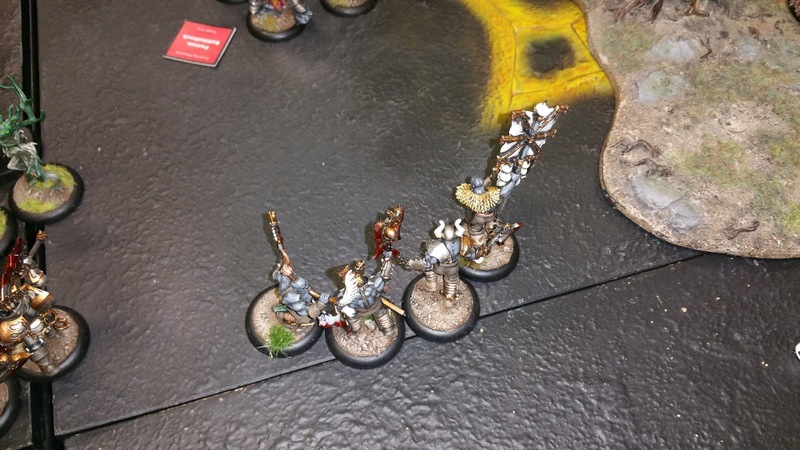 The Judicators loosed arrows towards the Bloodreavers but only managed to slay 2. With a mighty roar the Bloodsecrator planted the Portal of Skulls and the Khorne warband surged forwards taking the attack to their foe. The Corrupted Duerdin fired a volley at the Lord Celestant at the head of the enemy army and wounded him. Then with a stamping of feet the hoard surged again, and stumbled. The Stonehorn and Bloodwarriors failed to judge the distance to their foes and didn't make their charge. The Bloodreavers however did make it to the Lord Celestant and battle was met. The fury of the Bloodreavers driven by the Portal of Skulls seemed to almost overwhelm the Lord Celestant driving him back, his Sigmarite armour only just saving him from certain death. In response he swung his mighty hammer and in one blow slew six of these unarmoured barbarians, his dracoth tearing apart two more. He was a mights foe indeed. Khorne wins initiative and takes the first turn. With the portal of Skulls plant firmly in the ground the mighty lord of Khorne urges his warriors forward determined to close the distance to meet their foe with steel. The Brayshaman realising his magic was compromised by the banner swiftly moved away. With roll of gunfire the Corrupted Irondrakes fire upon the Lord Celestant again further wounding him. 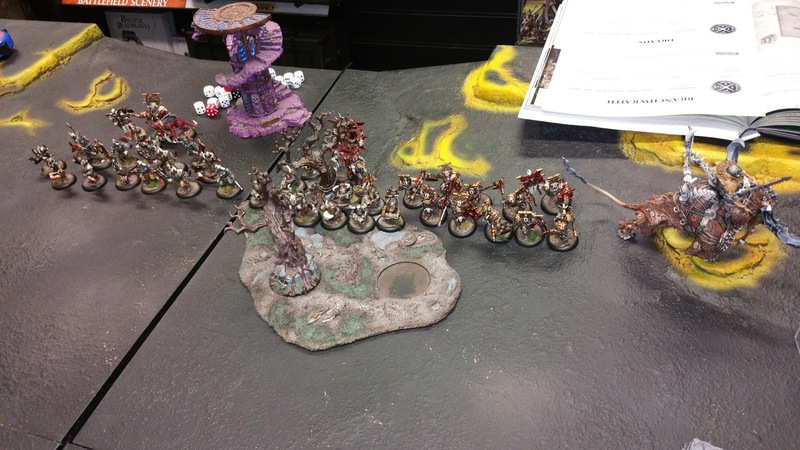 The Stonehorn bellows and charges forward into the Dryads followed swiftly by the Bloodwarriors. The Bloodreavers tore at the Lord Celestant dragging him from his mount and beating him to the ground. Back with the Stonehorn it crushes the unit of Dryads almost single-handedly with the Bloodwarriors finishing off the final ones. Calling out to the spirits the Branchwraith summons forth ten more Dryads. 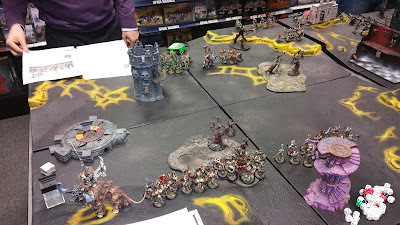 Shots from the Judicators streak into the Stonehorn scorching it's skin but with little real effect. 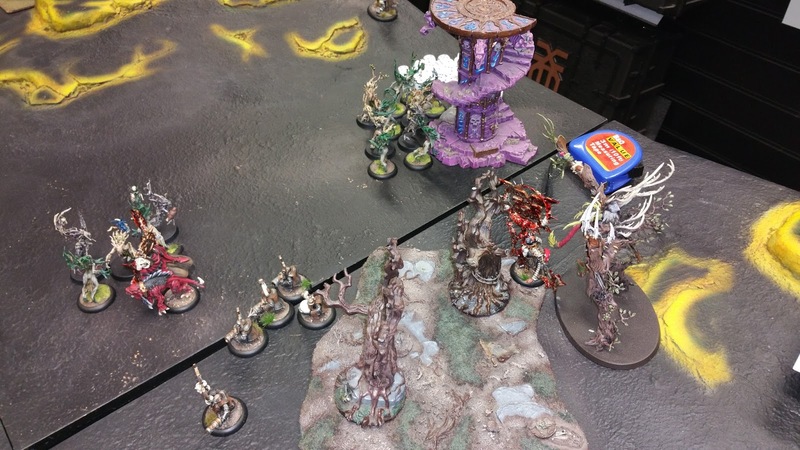 The Dryads advance towards the icon of chaos avoiding the Mighty Lord of Khorne. Stepping into the forest the Treelord ancient becomes one with the forest and reappears near the Bloodsecrator. 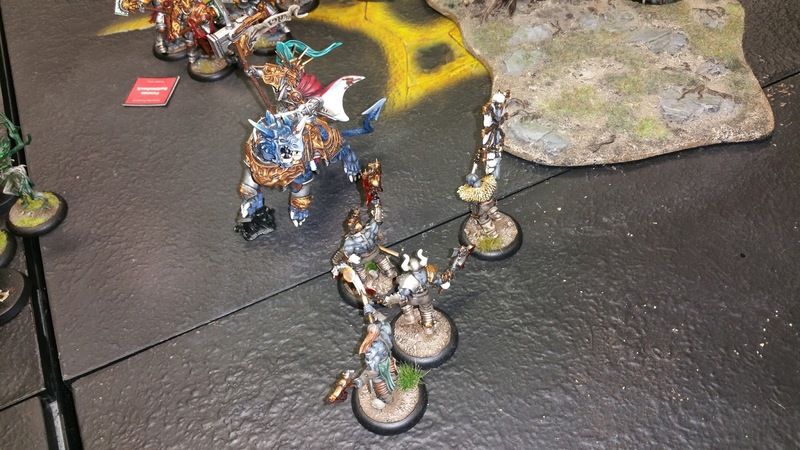 The Retributors charge into combat their hammers crackling with lightning. Striking the Stonehorn hard they begin to chip away at it. 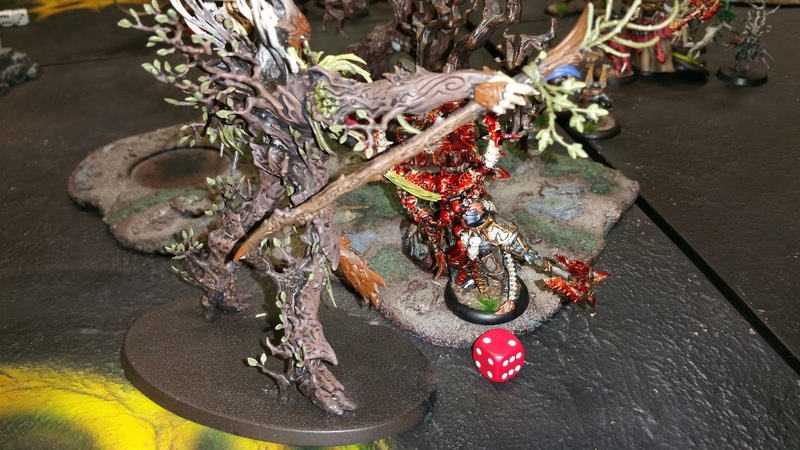 Exhausted by his journey through the Sylvaneth paths the Treelord fails to charge into the Bloodsecrator. At this point I had killed 23 models and the game was officially mine, but with 20 mins to go before we had to pack up we played on to see where the game took us. Once again the Branchwraith calls to the spirits of the forest and summons a further 5 Dryads. With more shots from the Judicators finding their mark on the Stonehorn it was really beginning to feel the damage. 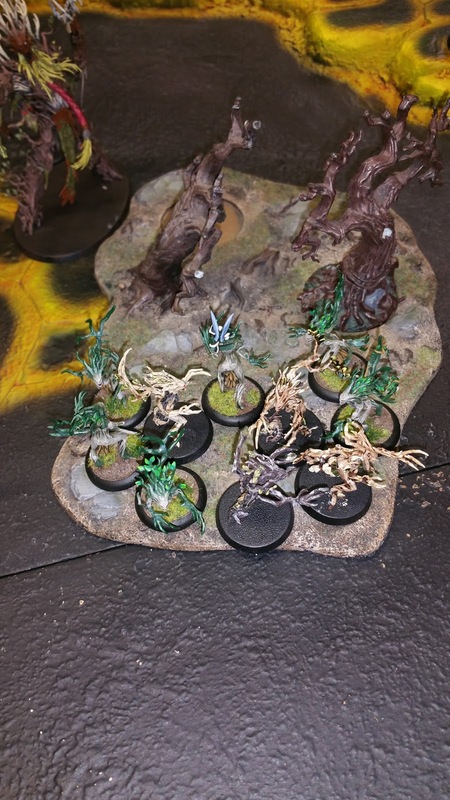 Ten Dryads manage to make it to the Icon and begin tearing at it. The Treelord thunders across to the Bloodsecrator, but he holds his balance and deftly avoids much of the incoming damage striking back and wounding it. The Stonehorn and Bloodwarriors trade blows with the Retributors and wipe out the unit with only minimal losses. The Khorne Lord was charged by the smaller unit of Dryads but managed to get his strikes in first and wiped them out. 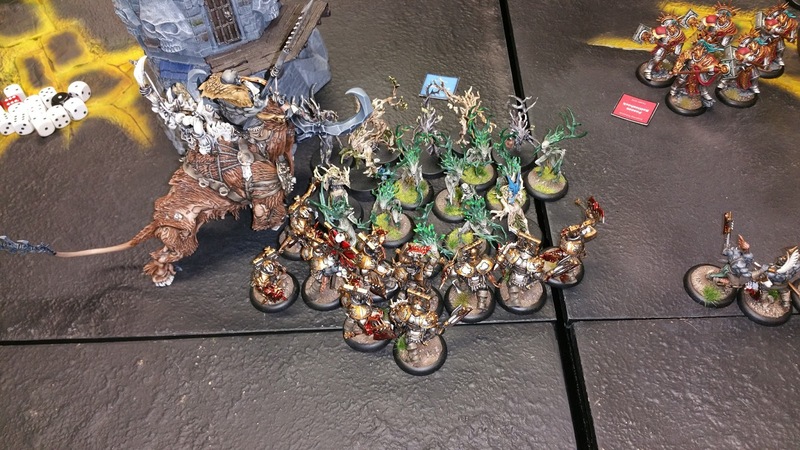 With only a single wound caused on the Icon and Chaos to fight next the Khorne victory was assured so we ended the game to give us a little time to check out some options for model purchases. Finally Charlie and I managed to play a game to conclusion, we've been scuppered by late starts due to traffic, power cuts and all sorts. It was a good game, we didn't bother using the terrain or time of war rules other than the Wildwoods this time to allow us to focus on learning our stats. This kept the game time to a minimum as we do only have abut an hour and a half before the store starts to close up. We may have to investigate other venues for gaming if we want to play for longer but the Leeds store is fairly convenient. It's a pity the staff don't really support the game as well as they could especially since its supposed to be the thing that helps turn around GWs fortunes. My tactic of targeting his 1 wound models first really gained me the game. 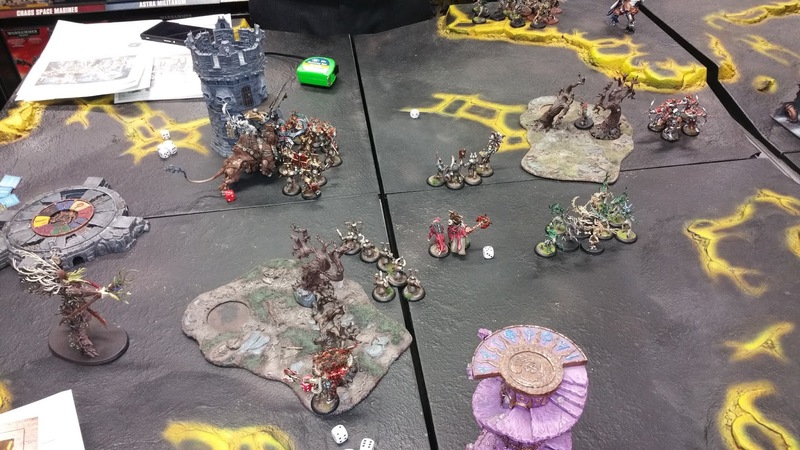 Charles game was solid and I suspect the next battle round would have swung it his way especially if his Treelord had finished off my Bloodsecrator in my half of battle round 3 as he would have been free to charge the icon as well. My major tactical error was placing my Brayshaman so close to the Bloodsecrator, he failed to get a single spell off all game and so was a wasted selection really. I'm still not impressed with the Bloodreavers even boosted with the totem the lack of rend means they suffer when up against a well armoured foe (both the Lord Celestant and the Dryads had 3+ saves so I cost to tie the Lord Celestant up for a couple of turns). As I hated painting them I really doubt I'll go for the double handed option so will likely drop then for more elite troops. Age of Sigmar does seem to suit lower model count more elite armies so I picked up some Skullreapers while I was in store to add to my force. The Duerdin didn't do fantastically but I do appreciate having some firepower in the force. It would have helped if I had been able to keep them stood still for a turn but I had to get then out of the wood to stop them taking mortal wounds. The Stonehorn was the undisputed champion here. Very tough and he really does hit hard. Supported by the Bloodwarriors and close to the tower ment that Charlie couldn't lap around to gain the numerical advantage so limited the number of incoming attacks quite substantially. I suspect that had the Retributors been able to get their full number into combat they'd have done a solid job of taking him down. I'm tempted by a Slaughterpriest as well, I've previously dismissed him but one of his abilities allows you to drag an enemy unit forward making charging into combat much more likely with the added benefit of disrupting battle lines as well. Chatting to Charlie post game he's quite taken by the Seraphon and was looking at the nee getting started box and a Slaan to get him off the ground, it'll be an interesting change to the line up and could give me trouble as the Slaan are fairly powerful, I'm only blessed by Charles slow painting speed and starting model count which means that I won't be swarmed with summoned units for some time yet. I've another post to make later on with some newly painted units for my Nurgle forces. Just to point out something about your game.. Hope you don't mind! This Battleplan actually put the Defender in a very weak position! My tactics as the Attacker will be to have 3 or 4 war machines shooting the Artifact and prepare a trap for the Defender who will be rushing out to kill me!! The Battleplan states that the larger army must be the Defender, which goes to show that the Attacker has an advantage. There are two ways to win the game as an Attacker, though one is pretty difficult. If the Attacker should use long range to take out the Artifact the Defender can always Mystic Shield the Artifact! But I believe it will lead to a very engaging game also. If possible give this game another try guys! Try to play in the Realm of Fire! Even more challenging! Cheers for reading. Unfortunately you cannot kill the artifact with ranged attacks, it does specify in the scenario that the artifact can be charged as if it was an enemy model and attacked in the combat phase. It does not allow for the artifact to be destroyed in the shooting phase. Rules out hitting it from range, the attacker must push through and get to the artifact to kill it. As we part comped the starting forces and I've been the attacker for the past 3 games I fancied the easy option. Post match we did discuss giving the attacker in future a slightly larger force, probably an extra couple of pool choices to balance it out a little.